"The county seems to have forgotten that the purpose of the civic building and its plaza is to serve the public interest. When a member of the community organizes an ongoing event that positively activates a public space and annually contributes $6.6 million to the local economy, she should be applauded and her efforts encouraged. That is what the greater Silver Spring community has done to support the Fenton Street Market. Now it’s the county government’s turn." "Having people USE downtown Silver Spring reduces crime, increases quality of life for the residents and vendors and makes this area of the county a better place to live and thus brings in revenues through more sales, higher property taxes (as homes go up in value), more successful businesses, etc." 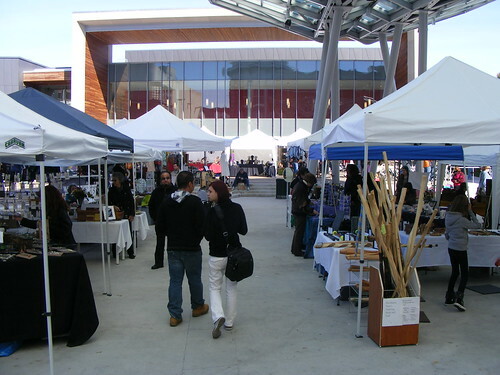 "Since the Fenton Street Market opened at the civic center, i have made it a point to shop there and the farmer's market (and not the Takoma Park farmer's market on Sunday, like I used to) nearly every Saturday. I usually end up spending money in nearby stores as a result of the proximity and convenience. I love the fact that it draws so many people out and feels like a real event every Saturday. Why on earth MC wants to now ruin the community that is building as a result of the market is beyond me . . ."
We did, however, hear from County Councilmember Hans Riemer, who opposes the increase in rates. "We spent tens of millions, hundreds of millions on downtown Silver Spring, and now we're coming up short on a few thousand dollars? It's ridiculous," says Riemer, who lives in East Silver Spring. Riemer worries that Veterans Plaza, which opened last summer, isn't drawing visitors like its predecessor "the Turf," noting that it's often empty when programmed events aren't going on. "Without the market, it's underutilized," he says. "[The plaza] doesn't naturally generate vibrancy. The market is great and it's worth subsidizing." After you fill out that petition, come by the market on Saturday for a "Community Roundtable" I'm hosting about youth issues in downtown Silver Spring. From skateboarding to curfews, each summer always brings a new discussion on how kids fit into the revitalized downtown, and everyone seems to have a strong opinion about it. What's yours? Join me from 12 to 1pm at Fenton Street Market (which, as always, runs from 9am to 3pm) in Veterans Plaza at the corner of Fenton Street and Ellsworth Drive.